The objective of this monograph is to present some methodological foundations of theoretical mechanics that are recommendable to graduate students prior to, or jointly with, the study of more advanced topics such as statistical mechanics, thermodynamics, and elementary particle physics. A program of this nature is inevitably centered on the methodological foundations for Newtonian systems, with particular reference to the central equations of our theories, that is, Lagrange's and Hamilton's equations. This program, realized through a study of the analytic representations in terms of Lagrange's and Hamilton's equations of generally nonconservative Newtonian systems (namely, systems with Newtonian forces not necessarily derivable from a potential function), falls within the context of the so-called Inverse Problem, and consists of three major aspects: I. The study of the necessary and sufficient conditions for the existence of a Lagrangian or Hamiltonian representation of given equations of motion with arbitrary forces; 1. The identification of the methods for the construction of a Lagrangian or Hamiltonian from the given equations of motion; and 3. The analysis of the significance of the underlying methodology for other aspects of Newtonian Mechanics, e. g. , transformation theory, symmetries, and first integrals for nonconservative Newtonian systems. 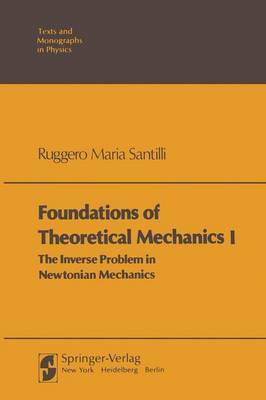 This first volume is devoted to the foundations of the Inverse Problem, with particular reference to aspects I and 2.